Hi there! I'm a week late on writing this recap. I was busy last week finishing up some paintings for Christopher Queen's 40th anniversary show. This is the 3rd year I have participated in this event. The support for this event seems to get better and better as the years go on. They usually cycle out most of the roster of artists, which keeps it from being an "old boys club" as many other events seem to turn into. I do get to see and meet new artists from around the country that I only ever get to see at this event. 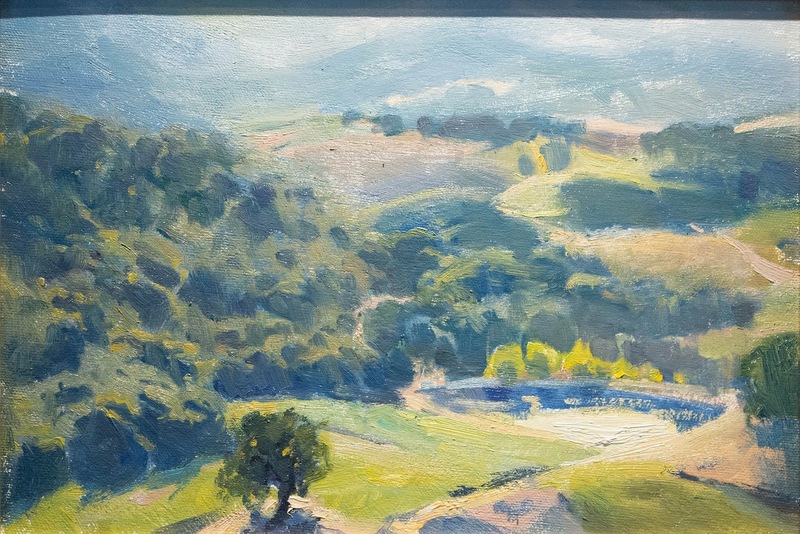 Paso Robles isn't the most inspiring town to paint overall (nor is Santa Rosa, to be fair) but it is surrounded by some of my favorite scenery in California. It has its own unique character even for California that combines the feel of rugged coastline a la NorCal, with the sunshine and pleasant weather of SoCal. 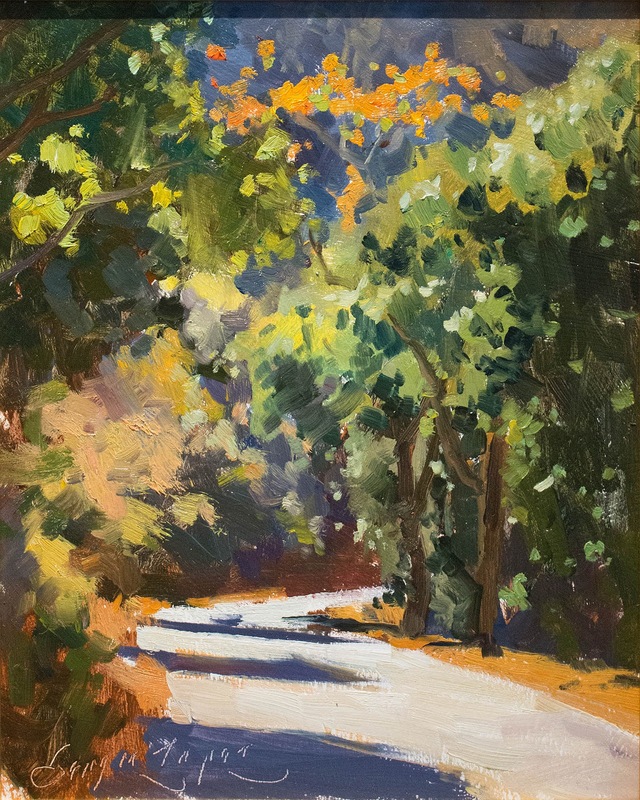 I find any reason to come back and paint the area, so a plein air event is the perfect reason. We also were told to bring a studio painting with us for the show, This was a piece that I started in Easton from life but finished it in my studio. 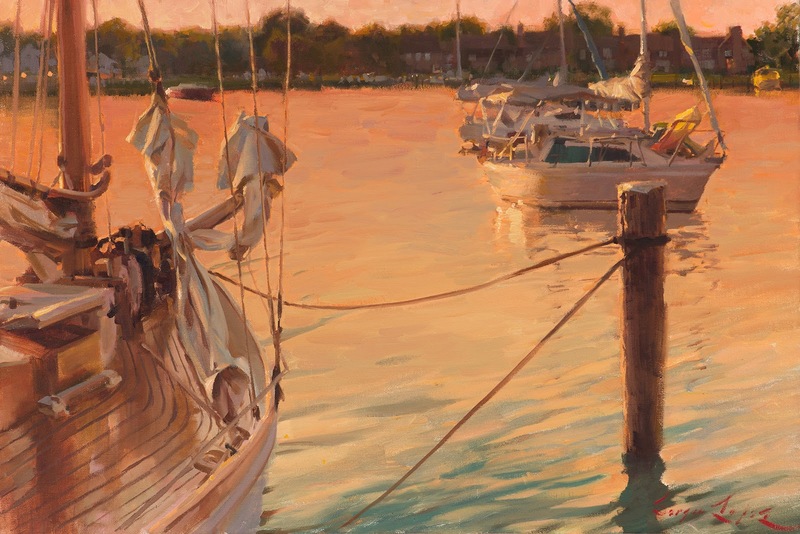 Even though it's an east coast scene, it has the sunset and boats that remind folks of Morro Bay. I drove down to the area on Monday. It was a record-breaking heat wave that came through the area. I had no motivation to paint that day because I didn't want to drive around any more after driving for 5 hours in 100-degree heat. I spent the rest of the evening relaxing and mentally preparing for the next day. I pushed myself to find some new places to paint this year. I found a little spot on Santa Rosa Creek Road. To the right was Santa Rosa Creek, which could have made for a beautiful scene except the amount of flies made painting the scene impossible. I still was happy enough with the scene in front of me on the turnout. This one was meant to be a warm-up, essentially. I was still pretty happy with it. "Morning Glitter" 10x8 in. oil on board. Available. 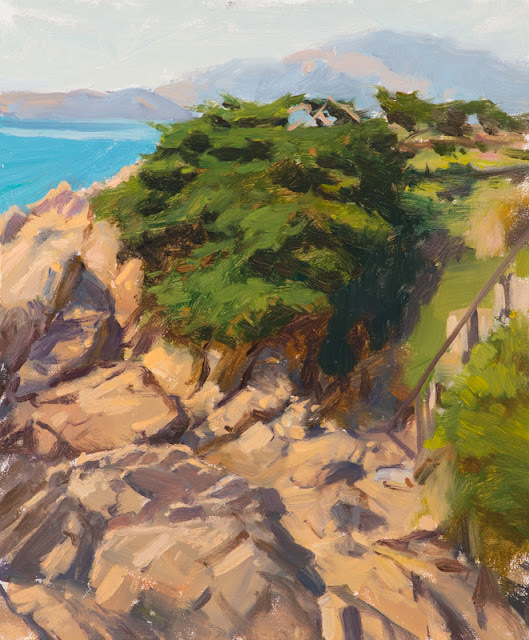 This painting was near Moonstone Beach. I really liked the scene, and I think I captured the feeling of being there fairly well. I just wish that the scene itself had more appealing shapes. 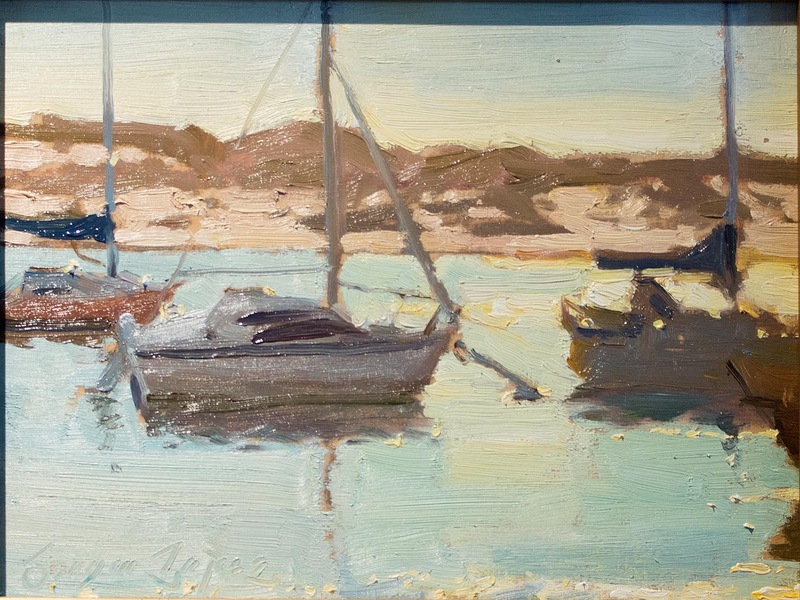 I did a quick painting of a scene on Morro Bay. I loved the way the sun hit the water. I don't know if I was 100% successful. I also painted on a shellacked panel. Was experimenting with this surface that I've never painted on. I like that it's easy to prepare and comes pre-toned just because you're painting on the color of the wood. I have some more panels that I'm looking forward to painting on. "Harbor Haven" 6x8 in. oil on board. Available. I painted this scene from a beautiful house with an amazing view near Adelaida Road. A handful of us artists were treated to a tour of their house and collection. Truthfully I was much more impressed with the house and the view than the art collection, but I respect anyone with the vision and means to curate their collection to fit their aesthetic. I was quite envious, in a good way. "Ridings View" 8x12 in. oil on linen mounted on board. Sold. The opening reception was nice. I enjoyed the brief talks that everyone gave about their experience with painting in the area. Some were entertaining, most were heartfelt. I wish I had recorded them with my phone, because they were inspiring; not only for the artists, but also for the collectors. We all saw a definite spike in sales after the talks. It just went to show the importance of having a good story that connects with the viewer. Words matter to the picture, like it or not. This was a good reminder of that. Sales were pretty good. I sold 2 paintings at a decent amount. I think that on average, most artists did that well. It does feel like there is more and more support growing for our art in this area. I love that, because it means I will probably keep getting the opportunity to paint in this wonderful area.